I snipped these images online: Olitski, from the Kemper Museum (linked above), Alexander Ross, from David Nolan Gallery (http://www.davidnolangallery.com/), Norman Bluhm, from Loretta Howard Gallery (www.lorettahoward.com) and Leon Kossoff, from Mitchell, Inness and Nash Gallery (http://www.miandn.com/). What a week of great shows! In Kansas City, the Olitski survey at the Kemper Museum stopped me cold. The various periods of Olitski's development were fascinating for their exploration of acrylics, particularly the sprayed ones, which toyed with the illusionistic effects of dispersion, but there was a fussiness about the border of each painting that drove me nuts. They reminded me of the posters from my college job in LA at the "postmodern" furniture and frame store in LA. My enjoyment of the earlier works was primarily historical, a join-the-dots experience. Then, like a crescendo of unexpected force, came four transcendent works from 2002, With Love and Disregard--that demanded at least an hour to absorb their chromatic fullness, their compositional depth and heft. What color, light, surface, abandon! Olitski didn't stop pushing the paint, ever--the results are fissured, planetary realms with complex spatial shifts. Thrilling to see a painter in his 80s hit his stride! Also enthralling to see someone play recklessly with the possibilities of their life's work and come up with something so convincing. It was like watching his brain move through his hand, which is the embodied value of painting. In the final four paintings, there was no false note, regret; they were sure-footed risks. This was not true throughout the show due to the fussiness of earlier work; thus meant the more. 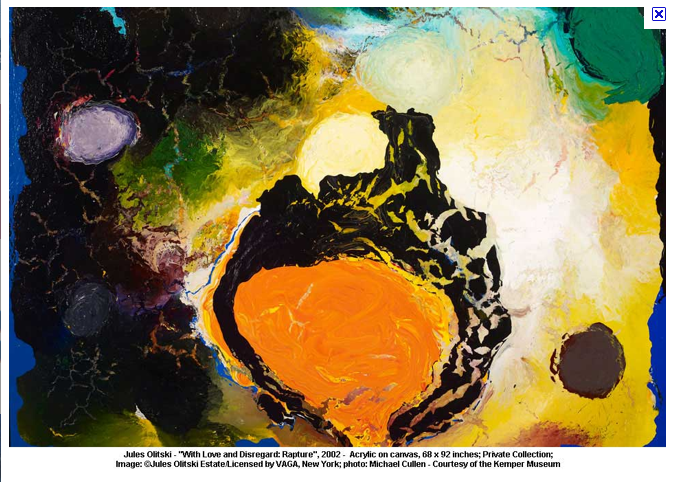 Olitski was a whole-hearted explorer! What inspires is that he found this in summary, not early on. And these are GREAT paintings, filled with ideas and images. The earlier sprayed works, especially the topographies, brought to mind three paintings I saw today by Ben Schumacher in the current show "We Regret To Inform You There Is Currently No Space or Place for Abstract Painting" at Martos (http://www.martosgallery.com). I am noticing more historical shows tracing such relationships, such as Unpainted Paintings uptown and the Painting show on 25th St. Given our eight years in the Middle East, it comes as no surprise that 1970s postwar abstraction, on the heels of 1950s postwar abstraction, seems newly relevant. Also, relationships between expressionism and Color Field seem important now, in a way I would liken to Impressionists and post-Impressionists--aware of the nationalistic implications as well. Down 29th Street from Martos, Alexander Ross's exhibition at David Nolan revealed the artist's expansion of his bell-pepper-like forms into surreal landscape spaces recalling de Chirico. 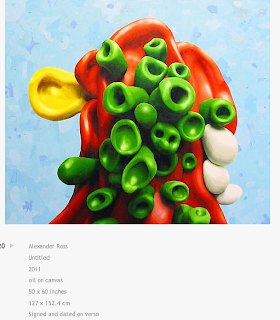 Ross's palette was startling, as was his paint--licking and encircling form, strokes like fire; becoming protagonists of thick and juicy facture that catches the light, causing a shimmering veil of pattern viewing the paintings from aside. And the color! Ross has always built color in a gradated range of color, not dissimilar from how pastels are made. He's hit new strides in this show--reds disintegrating into plummy rust tones, acid greens like slightly soured candy invading the more usual greens tending toward blue. The show revealed a maximal tendency redefining Ross's previously pared down, architectural forms. 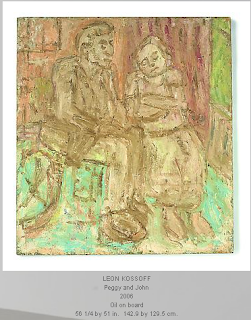 On 26th St. at Mitchell, Inness and Nash, Leon Kossoff's palette concocted strange, umber-y brews, with limpid greens and reds furnishing ballast in the roiling surfaces of paint. The drawing in them was not so great, but the "put" of mark and the palette-- superb, pearly; like winter light describing spring--gave his architectural forms, in particular, heft. And on 26th, David Cohen's Fitting Room (http://www.vogtgallery.com/), featured two favorite painters, Mernet Larsen and David B. Brody, whose work has recently been shown in New York and is mentioned on this blog. These may be the last shows I see before leaving for Beijing Sunday. I wonder what painting will be like there? Maps, or signs, conflate landscape with diagram, transforming geography into hybrid schemas. Wikipedia defines shema: "The word schema comes from the Greek word "σχήμα" (skhēma), which means shape, or more generally, plan. Schema may refer to:Model (abstract), Diagram, or Schematic, a diagram that represents the elements of a system using abstract, graphic symbols." The distancing layer of stylization help us navigate unfamiliar space; visually, it presages digital screens. I think about schemas after seeing Margrit Lewczuk's exhibition, Drawing Into Paint. Her works re-interpret non-western sources as abstract systems similar to maps or signs. They alchemize graphite, gouache and paint into mysterious patterns that juggle allusions to figure and landscape while merging a map's reductive topologies with the colorful brevity of signage. Lewczuk's paintings are pure buoyancy, saturating the light-filled gallery with sonorous, resonant hues barely contained in deceptively simple demarcations of space. Four large paintings anchor the whole, orbited by collages and drawings. It's like entering a 3-d version of the artist's brain. Unique relationships emerge between works: a tiny reddish-purple study parked at the bottom corner of a large, predominantly green painting holds both paintings in mutual abeyance, through the vibration of its intense darks. Correspondences and cross-reference circulate the show. 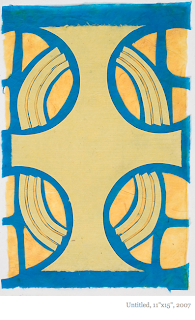 Many of the works portray an image-pattern one might associate with a rounded cruciform, insect head or African textile. Their color and placement of material, texture and edge is extremely specific in a way that anticipates image, but the works abstain from recognizable form. They instead harness structure in the service of materials; deckled or cut edges, surfaces of cascading paint and ferocious graphite markings, contained in discrete areas, vacillate rhythmically together, delighting and enrapturing the eye. Another version of schema re-emerges in Rockwell Kent's Greenland paintings: Greenland People, Dogs and Mountains, c. 1932-35, oil on canvas mounted on panel, 28 1/8 x 48 inches, Bowdoin College Museum of Art, Brunswick, Maine, below. Kent's Greenland paintings are new discoveries, thanks to Steve Martin's art-world yarn, An Object of Beauty. It's interesting to think about how his stylized terrains and Lewczuk's joyous investigations of color and structure approach composition over the seventy year period that divides them. Waiting for a plane: mechanical difficulties. The weather is perfect in Kansas City; the soil rich; the space stretched green in all directions. I am here unexpectedly, closing the affairs of my beloved aunt, who died unexpectedly last week. This was a group show on contemporary abstraction, curated by Chris Chatterson and Vince Contrarino, at the Bronx River Art Center. A catalogue is available on blurb, and I look forward to its insights on abstraction. A show I would have curated if someone else didn't! 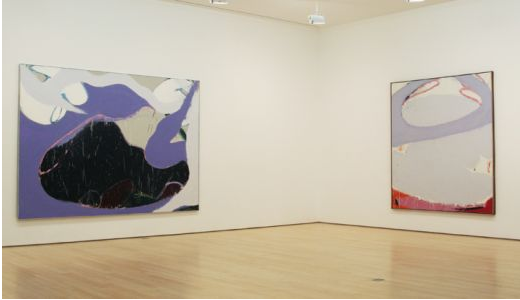 Linked above, Chris Chatterson's posts from my show and New Monuments, both at Lesley Heller, on KCLOG, a blog I relish for its visual connections and pathways through abstraction. Meanwhile, my eyes find solace in the endless green of fields.